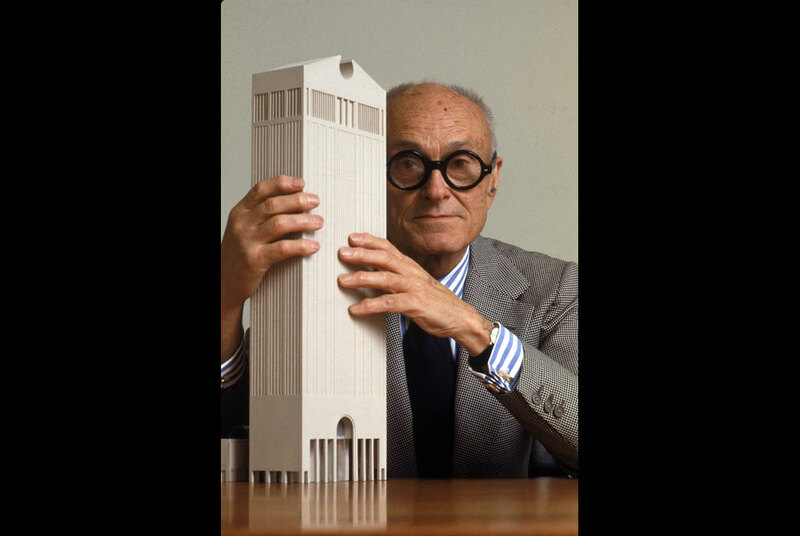 May 1978 portrait of Philip Johnson (then in his 70s) with a model of his newly-designed headquarters building for AT&T in New York City. Its postmodern style and Chippendale top made it controversial from the start. Photo: Bill Pierce/Time & Life Pictures/Getty Images. NEW YORK, NY.- Out of the depths of a privately owned and previously unknown archive of drawings by the influential and always controversial postmodern architect Philip Johnson (1906-2005), The Victoria and Albert Museum (V&A) in London has acquired a drawing of the Madison Avenue façade of the famed AT&T skyscraper in New York City (now Sony Plaza). The UK s national museum of art and design, the V&A acquired the 7½-foot-tall, hand-drawn drawing of the building with the Chippendale top through Chicago s Wright auction house this past April for $70,000. This is one of the most important architectural works on paper of the second half of the 20th-century, which can now play a significant part in the V&As forthcoming exhibition on Postmodernism, said Glenn Adamson, Head of Graduate Studies in the Victoria and Alberts Research Department. The drawing will appear publicly for the first time in over a quarter-century in Postmodernism: Style and Subversion 1970-1990, opening in 2011. The AT&T building, completed in 1984, was one of the most significant and widely-debated buildings of its time. This is the primary presentation drawing, and no other exists in any public collection internationally. The V&A has an extensive collection of 35,000 architectural drawings, but few are by American architects. This is its first acquisition of a work by Philip Johnson. The V&As purchase is also noteworthy because the AT&T presentation drawing is the only work acquired from this privately-held Johnson archive to date. An extensive private archive. The extent of the private Johnson holdings became known only within the last two years, according to James Frankel and Andrew Ross, partners in the New York-based Construction Practice Group at the law firm of Arent Fox, who represent the anonymous owner. To assess and appraise this extensive holding of tens of thousands of sketches with associated plans and renderings, and sets of photographs (many by Ezra Stoller and Richard Payne), Arent Fox brought in two internationally noted experts: Michael Robinson, an appraiser of architectural materials and 20th-century papers, and Willis Van Devanter, the long-term curator of Paul Mellons archive. Both have advised the Library of Congress on architectural collections. Also consulted was Wilbert Hasbrouck of Chicago s famed Prairie Avenue Bookshop. Built and unbuilt projects in the collection. According to Robinson, these works comprise more than 120 separate projects made between 1968 and 1992, Johnsons most productive period, when iconic structures and complexes such as the Crystal Cathedral, PPG Place (Pittsburgh), and Pennzoil Place (Houston) were built. The collection contains the retained working drawings for at least 50 unbuilt projects, from entire office complexes, airport terminals, hotels, and a casino, to a house in New Canaan (CT) for Johnsons long-time companion, the late David Whitney. Many of this group, Robinson reports, are complete and final, such as Port of America (on the Potomac), London Bridge City , and four office towers for Times Square . Architect Philip Johnson, who lived to the age of 98, reportedly once said, All architects want to live beyond their deaths. As it turns out, Johnson might yet again have his way.